Colima Volcano (aka el Volcán de Colima or el Volcán de Fuego) continues to erupt, displaying its fiery temper by throwing massive plumes of ash and smoke several kilometers into the air. One recent eruption caused a plume of ash seven kilometers high. Following the eruptions of 10 and 11 July 2015 (see video clip from Webcams de México), a state of emergency has been declared by the state of Colima in 5 municipalities: Colima, Comala, Coquimatlán, Cuauhtémoc and Villa de Álvarez. This enables rapid access to state and federal funds in preparing to cope with any potential disaster. A precautionary evacuation has been ordered of all communities within a 12-kilometer radius of the volcano’s crater. The 50-60 residents of the closest community to the volcano, La Yerbabuena, live barely eight kilometers (five miles) away from the crater. Five centimeters (two inches) of ash fell on La Yerbabuena in the past few days. Authorities are concerned that heavy summer rains could generate dangerous and very fast-moving lahars. Lahars are mudflows of volcanic ash, pumice and rocks; they can travel at velocities of up to 100 km/h and move huge boulders and objects as large as houses. 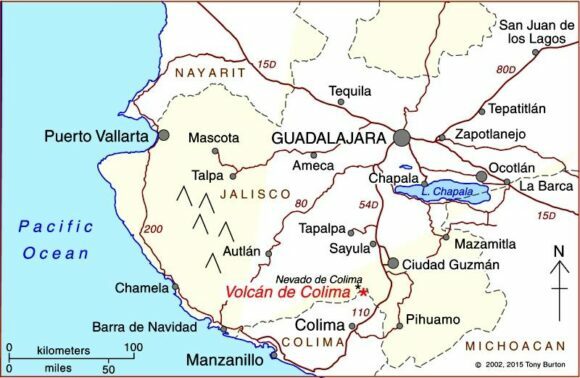 Where is Colima Volcano (Volcán de Colima)? Colima Volcano is considered one of Mexico’s most dangerous volcanoes. Numerous villages in its shadow keep a wary eye on its level of activity, and emergency evacuations have become a regular event over the past fifty years. How high is Colima Volcano? The elevation of Colima Volcano is officially given as 3820 m (12,533 ft) above sea level. In the past 400 years, it has been the most active volcano in Mexico, having erupted at least 30 times since 1576. Recent activity means that this exact height may no longer be correct. The eruption of Colima Volcano on 21 January 2015, shown in this short video, is typical of recent activity. How often does it erupt? Historically, the eruptions of the volcano have fallen into a definite cyclical pattern with periods of activity, each lasting about 50 years, interspersed with periods of dormancy. The first cycle of activity (after the Spanish arrived in Mexico) was between 1576 and 1611. Major eruptions occurred in 1680 and 1690, and further complete cycles occurred between 1749 and 1818, and from 1869 to 1913. Most geologists agree that current activity is part of the fifth cycle, which began in 1961. Judging by past performance, we should be nearing the end of this cycle, though volcanoes can be extremely unpredictable, so don’t bet your house on this happening within the next decade. In early 2015, activity began to intensify, with several spectacular eruptions, sending ash and dust up to 8 or 9 kilometers (5-6 miles) into the air. Ash fell on towns up to 25 kilometers (15 miles) away from the volcano, in locations including Tuxpan, Zapotiltic and Ciudad Guzmán, but with no loss of life, or significant property damage. The volcano can be viewed via this permanent fixed webcam operated by Webcams de Mexico. Below the main image on that site are links to 1-minute time-condensed videos showing the past 24 hours of activity. 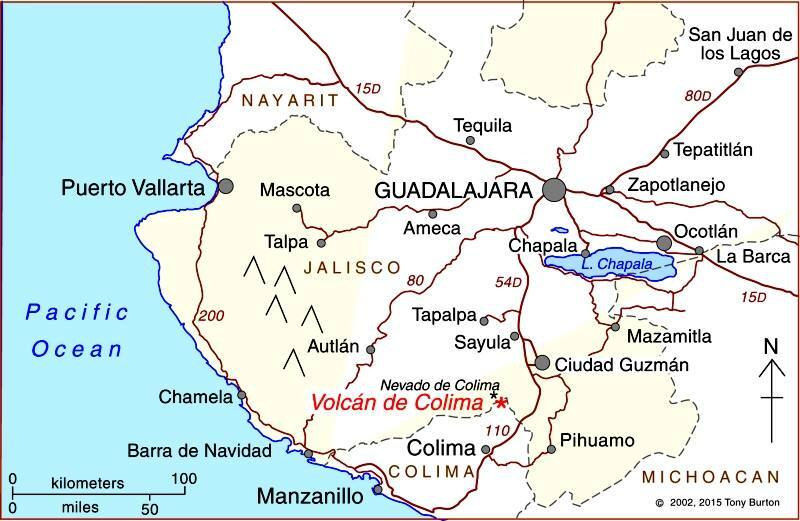 The area around the Colima Volcano is described in more detail in chapter 15 of my Western Mexico, a Traveler’s Treasury (4th edition; Sombrero Books, 2013). Happy Christmas from Geo-Mexico! – ¡Feliz Navidad! Which tectonic plates affect Mexico? Bob said This is COOL!